Home: Urban Design » What is Urban Design? Urban design is concerned with the arrangement, appearance and function of our suburbs, towns and cities. It is both a process and an outcome of creating localities in which people live, engage with each other, and engage with the physical place around them. 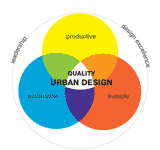 Urban design involves many different disciplines including planning, development, architecture, landscape architecture, engineering, economics, law and finance, among others. Urban design operates at many scales, from the macro scale of the urban structure (planning, zoning, transport and infrastructure networks) to the micro scale of street furniture and lighting. When fully integrated into policy and planning systems, urban design can be used to inform land use planning, infrastructure, built form and even the socio-demographic mix of a place. Urban design can influence the economic success and socio-economic composition of a locality—whether it encourages local businesses and entrepreneurship; whether it attracts people to live there; whether the costs of housing and travel are affordable; and whether access to job opportunities, facilities and services are equitable. Urban design determines the physical scale, space and ambience of a place and establishes the built and natural forms within which individual buildings and infrastructure are sited. As such, it affects the balance between natural ecosystems and built environments,and their sustainability outcomes. Urban design can influence health and the social and cultural impacts of a locality: how people interact with each other, how they move around, and how they use a place. Although urban design is often delivered as a specific ‘project’, it is in fact a long-term process that continues to evolve over time. It is this layering of building and infrastructure types, natural ecosystems, communities and cultures that gives places their unique characteristics and identities. This diagramshows the approximate hierarchical relationship between the elements of urban design, followed by a brief definition of each of the elements. The section below provides basic explanations for terms that are commonly used for urban design in the Australian context. The overall framework of a region, town or precinct, showing relationships between zones of built forms, land forms, natural environments, activities and open spaces. It encompasses broader systems including transport and infrastructure networks. The balance of open space to built form, and the nature and extent of subdividing an area into smaller parcels or blocks. For example a ‘fine urban grain’ might constitute a network of small or detailed streetscapes. It takes into consideration the hierarchy of street types, the physical linkages and movement between locations, and modes of transport. The intensity of development and the range of different uses (such as residential, commercial, institutional or recreational uses). The scale of buildings in relation to height and floor area, and how they relate to surrounding land forms, buildings and streets. It also incorporates building envelope, site coverage and solar orientation. Height and massing create the sense of openness or enclosure, and affect the amenity of streets, spaces and other buildings. The design of public spaces such as streets, open spaces and pathways, and includes landscaping, microclimate, shading and planting. The relationship of buildings to the site, street and neighbouring buildings (alignment, setbacks, boundary treatment) and the architectural expression of their facades (projections, openings, patterns and materials). The close-up appearance of objects and surfaces and the selection of materials in terms of detail, craftsmanship, texture, colour, durability, sustainability and treatment. It includes street furniture, paving, lighting and signage. It contributes to human comfort, safety and enjoyment of the public domain. Much of urban design is concerned with the design and management of publicly used space (also referred to as the public realm or public domain) and the way this is experienced and used. The public realm includes the natural and built environment used by the general public on a day-to-day basis such as streets, plazas, parks, and public infrastructure. Some aspects of privately owned space such as the bulk and scale of buildings, or gardens that are visible from the public realm, can also contribute to the overall result. At times, there is a blurring of public and private realms, particularly where privately owned space is publicly used. The natural environment includes the topography of landforms, water courses, flora and fauna—whether natural or introduced. It may be in the form of rivers and creeks, lakes, bushland, parks and recreational facilities, streetscapes or private gardens, and is often referred to as ‘green infrastructure’. The non-physical aspects of the urban form which include social factors (culture, participation, health and well-being) as well as the productive capacity and economic prosperity of a community. It incorporates aspects such as demographics and life stages, social interaction and support networks. The size, bulk and perception of a buildings and spaces. Bulk refers to the height, width and depth of a building in relation to other surrounding buildings, the street, setbacks and surrounding open space. For example, a large building set amongst other smaller buildings may seem ‘out of scale’. The arrangement of a built up area. This arrangement is made up of many components including how close buildings and uses are together; what uses are located where; and how much of the natural environment is a part of the built up area.